Duncan as the first fairy in A Midsummer Night's Dream. 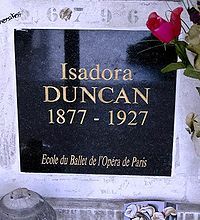 Isadora Duncan (May 27, 1877 – September 14, 1927) was an American dancer. She was an inspiration for modern dance. Duncan was born in San Francisco, California. She preferred natural movement, instead of what she called the artificial movements of ballet. Her 'free dance movement' was based on simple, flowing movements of the body. It was inspired by nature, and by ancient Greek sculptures. Costumes were flowing and transparent. Dances involved simple runs, skips and jumps, big gestures and mime. Duncan was wildly unconventional. A bisexual who had two children but did not marry either of their fathers, she became a communist, and boasted about it. She went to the Soviet Union in 1922, but left in less than two years. At different times she lived in Paris, London and other European cities. She started dance schools in Moscow, Berlin and Paris. The schools did not last long, but Duncan had admirers who have continued her influence to the present day. Duncan's private life was tragic. Both her children were killed in a strange accident on the River Seine in 1913. The children were in a car with their nanny when the car stalled as the driver tried to avoid a collision. He got out to hand-crank the engine, but forgot to put the brake on. The car rolled across the road, down the bank and into the river. The children and their nanny drowned. Duncan married poet Sergei Yesenin (1895–1925) in 1922. He left her in 1923, and hanged himself two years later. Duncan liked long, flowing scarves. One of these scarves caused her own death. As The New York Times noted in its obituary: "Isadora Duncan, the American dancer, tonight met a tragic death at Nice on the Riviera. According to dispatches from Nice, Miss Duncan was hurled in an extraordinary manner from an open automobile in which she was riding and instantly killed". At her death, Duncan was a Soviet citizen. "Isadora Duncan’s death was as dramatic as her life. On September 14, 1927, she encountered a young driver in Nice, France and suggested he take her for a spin in his open-air Bugatti sports car. As the car took off, she reportedly shouted to her friends, "Adieu, mes amis, je vais a la gloire!" — “Goodbye my friends, I go to glory!" Moments later, her trailing shawl became entangled in the rear wheel, breaking her neck instantly". Born in the United States, she lived in Europe from the age of 22 until her death at age 50. In the United States she was popular only in New York, and then only later in her life. Her work was continued by some of her six adopted daughters. They were her pupils, the Isadorables, who continued to teach her methods after her death. There have been several revivals of interest in Duncan. There was a film, Isadora (1969) by Karl Reisz. There were two ballets. Five Brahms Waltzes in the Manner of Isadora by Frederick Ashton had its first show in 1976. Kenneth Macmillan created a two-act ballet Isadora for the Royal Ballet (1981). In New York her tradition has passed to third generation Duncan dancer Lori Belilove. She founded The Isadora Duncan Dance Foundation in 1979 and The Isadora Duncan Dance Company in 1989. Her ideas on natural dance influenced a wide range of other dancers. Some of the ideas of the Denishawn School of Dancing are quite Duncanesque, and the growth of modern dance in general owes something to her. ↑ "Isadora Duncan, dragged by scarf from auto, killed". The New York Times. 1927-09-15. Retrieved 2007-07-02. Archive film of Anna Duncan dancing a piece by Isadora Duncan in 1942 at Jacob's Pillow. Anna Duncan was one of her adopted daughters. This page was last changed on 16 April 2019, at 23:26.